Abstract: This study aims to determine the attributes that are considered important by consumers to achieve customer satisfaction, determine the level of performance in Twissterdog, know the level of satisfaction or level of consumer suitability of products and services in Twissterdog, and determine the attributes that need to get priority from the company to achievement of customer satisfaction. This research was conducted in Twissterdog with the sample used was 97 respondents by using purposive and accidental sampling method. Data obtained from the questionnaire distribution were analyzed by Importance Performance Analysis method. The result of research shows that attribute with highest level of customer satisfaction on product quality is clarity of name and logo of company with satisfaction level 222%, attribute with lowest satisfaction level is price match with consumer interest, food presentation and price match with product quality with satisfaction level equal to 80.84%. Attributes with the highest level of customer satisfaction on the quality of service is the hospitality of the waiter and the courtesy of the waiter with a satisfaction level of 218%. Attribute with the lowest level of customer satisfaction on the quality of service is the convenience of café with a satisfaction level of 43%. Attributes that should be prioritized on product quality are price conformity with consumer interest, food presentation and price conformity with product quality. The attributes that must be prioritized on the quality of service is the ease of reaching the location, the cleanliness of the cafe, the availability of parking facilities and the convenience of the cafe. Keywords : Customer satisfaction, Importance Performance Analysis, Twissterdog. 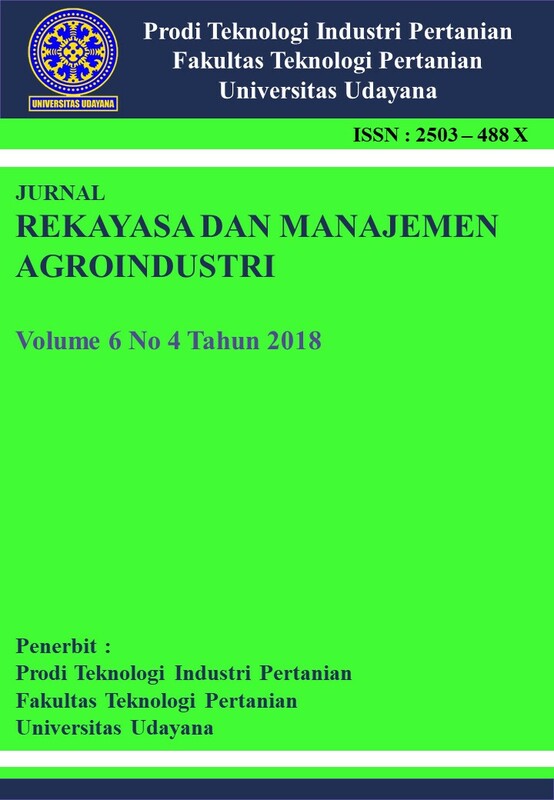 Abstract: The aim of this research is to know the number of distribution channel of the flower from farmers in Petang District to the retailer, to know the impact of postharvest loss on the flower of farmers from Petang District to retailers.The research used commodity system assessment method method in the form of questionnaires distributed to farmers, collectors, and flower retailers. Impact of handling during farmer level is at clearance and sorting significance reach 15,33%.At the level of collectors is on cleaning and sorting significantly reaches 5.17%. Meanwhile, at the retailer level the impact of sorting on the loss of flower interest is significant ie 12.5%. Physical damage that occurred in the form of flower broken flower at sortation. Physical damage occurs due to collisions, friction, and piles during the distribution process at the retailer level. Keywords : CSAM, distribution channels, flower.